Marmur and his colleagues in 1963 on the DNA of bacteriophage SP8, which infects the bacterium Bacillus subtilus. This phage carries its genetic information in the form of a double-stranded DNA molecule. The two strands have different base compositions and therefore different densities, which permits the separation of the strands by equilibrium density gradient centrifugation (see Figure 12.2) into "heavy" and "light" DNA strands. Marmur and his colleagues placed some B. subtilis in a medium that contained a radioactively labeled precursor of RNA (< Figure 13.5). They infected the bacteria with SP8, and the phage injected their DNA into the bacterial cells. 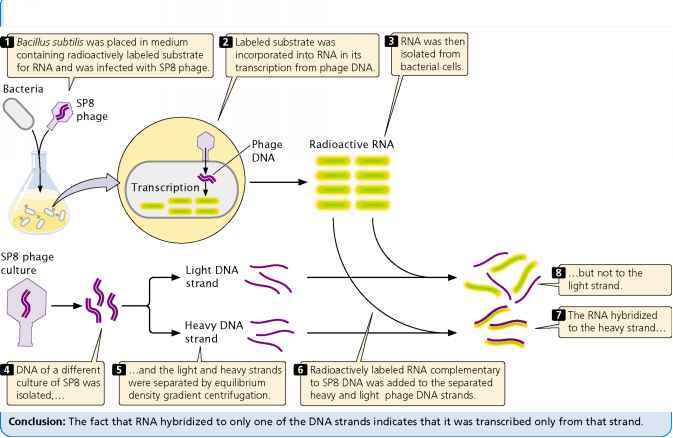 Transcription of the phage DNA within the cells incorporated the radioactive precursor into the newly synthesized RNA, producing radioactively labeled RNA complementary to the phage DNA (step 2), which was then isolated from the cells (step 3). The DNA of another culture of SP8 phage was isolated (step 4) and the heavy and light strands of the DNA were separated (step 5). When the radioactively labeled RNA (obtained in steps 1 through 3 of Figure 13.5) was com bined with the heavy strand (step 6), the RNA hybridized to it, indicating that the RNA and DNA were complementary (step 7). However, when radioactively labeled RNA was added to the light strand (step 8), no hybridization took place. These findings led Marmur and his colleagues to conclude that RNA is transcribed from only one of the DNA strands in SP8—in this case, the heavy strand. 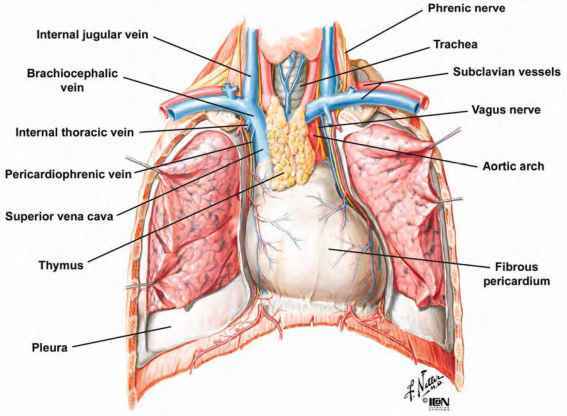 SP8 is unusual in that all of its genes are transcribed from the same strand. In most organisms, each gene is transcribed from a single strand, but different genes may be transcribed from different strands (IFigure 13.6). Notice that one of the strands in Figure 13.6 is identified as plus (+) and the other as minus (—). The plus strand is the template for genes a and c, and the minus strand is the template for gene b. During transcription, an RNA molecule is synthesized that is complementary and antiparallel to the DNA template strand (see Figure 13.4). The RNA transcript has the same polarity and base sequence as does the nontemplate strand, with the exception that U in RNA substitutes for T in DNA. Question: Do both strands of DNA serve as templates for RNA synthesis?